The loss of sensibility in the hands in combination with retinopathy is especially debilitating since this may significantly decrease the patient’s ability to read Braille with their fingers. kidney transplant and dialysis patients have diabetes. to the impaired blood circulation, may take a long time to heal. foot amputations carried out each year. carries a good prognosis, and often leads to considerably improved sensibility in the hand. For the foot, assessment of the protective sensation is essential for evaluation of the risk for skin ulceration. Being able to detect diminished protective sensation at an early stage reduces the risk for time-consuming medical foot ulcer care and amputations. checkups conducted by a doctor or diabetes nurse. For the examination, it’s recommended to check the ability to sense vibrations, pressure, pain and pulse. of the foot health status. can be found before the patients develop diabetic ulcers. Also, to effectively examine a population currently amounting to some 387 million people globally with current methods would take up enormous amounts of resources. assessment and health surveillance required by EU directive 2002/44/EC. control the medical effects due to modifications of the workplace. due to incipient neuropathy or nerve entrapments such as Carpal tunnel syndrome. described in the ISO 13091-1/2 standard. is exposed to controlled mechanical vibrations of varying intensity and frequency. The patient indicates by pushing a button when s/he feels a vibration on the exposed finger. 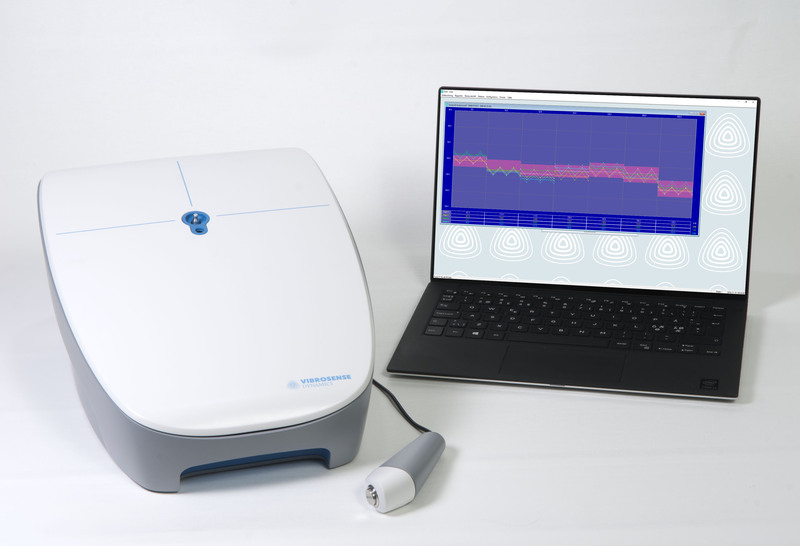 The VibroSense Meter is a superior example of a medical device for Multi-frequency Vibrometry examinations. Automatic comparison against comprehensive normative age-matched population data. Questionnaires adopted for hand-arm vibration screening, including the Stockholm Workshops Scale grading. Inbuilt measuring of finger skin temperature, prior to each vibrogram recording. Support for long-time follow up of groups or individuals. Support for statistics regarding preventive measures in the workplace environment. Preventive measures at the workplace. Accessories included: Measurement Unit, Trigger Switch, Power Supply, Carrying Case, PC software (VSM). The integrated questionnaire for HAVS is included as standard. tools or machinery. Vibration injuries are divided into three subgroups: neurological disorders, vascular and musculoskeletal. water into a glass or inserting a key into a lock. Carpal Tunnel Syndrome is another common neurological vibration injury. If detected in time, most patients are expected to make a full recovery. experiencing a major discomfort such as tingling and pain. while prophylactic measures are still effective. and can be extremely painful.